Have you ever bought an accessory only to find out that you already have two or three of them at home? Or you purchase a pack of hot dogs and a pack of hot dog rolls only to discover there are not enough rolls for each hot dog? It seems to me that having too much of one thing and not enough of the other is a marketing strategy for the unsuspecting victim to fork over more money then intended. Well it's time to fight back. How? By making good use of what you already have. Using your smartphone list every product you purchase and store it in an inventory application. Keep an inventory of all the products and accessories you've purchased in alpha order. If the item requires replacement indicate this with an alphabetic marker (r). Also add the item barcode number so you can find out if it's compatible with another product you wish to purchase. It's time to start using these smartphone apps for more than just lists. Download a bar code scanner along with compatible apps that allow you to do price comparisons, calculate the cost of budget supplies and maintain an inventory complete with warranty info and product manual instructions. It's the smarter way to enter data. Now you're armed and ready to shop smart and save. Making good use of what you already have requires knowing all there is to know about the products and applications you've purchased. Many times our reunion planners forget all the many features in Fimark's Family Reunion Planner and end up scouring the Internet for other applications, poems, certificates and books. No need. Just consider the following features in the reunion event planning application and online worksheets/printables download interface. First off you have three different reunion planning guides in one. On the "WORKBOOKS" interface you have access to two workbooks/guides. One in PDF form and the other in MS Word format. Both are complete guides with worksheets for editing and printing. On the interface itself are printable worksheets for taking a survey, setting up your daily itinerary, dinner banquet program, reunion keepsake booklet and welcome letter as well as access to 12 flyers. If you're looking for tour services, shows, restaurants and vendors in the area just go to the "LOOKUP" panel in your Family Reunion Planner interface. 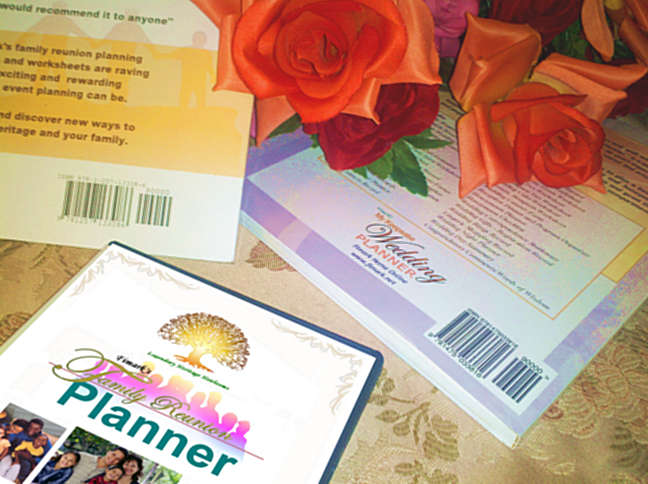 If you're looking for award certificates it's included in your Family Reunion Planner package. Remember all printables including poems, booklets greetings cards and flyers are free when you purchase Fimark's Family Reunion Planner. Just click the "Get Theme Printables Here" link on the blue bar on the download interface. If you're looking for meaningful inspiring family reunion poems you'll find five free popular poems when you purchase Fimark's Family Reunion Planner package. Just click the "Get Themed Printables Here" link on the blue bar of the application. Just want a few of these beautiful poems? It's in there. Did you know the author of the poem "Finding Our Way Home" and "We Rise To Tell The Story" is also the author of Fimark's Family Reunion Planner Guide Book and Keepsake? Get the book and family reunion applications at a deep discount with Season Specials. What? Don't have Fimark's Family Reunion Planner social web app yet? Now there is a summer special going on. Get the complete Family Reunion Planner package which includes Fimark's Family Reunion Planner Guide ebook, and Instant download of all printables, applications and worksheets. List Price $49. Now $39 for a limited time. You save $10 dollars. No coupon code needed. For more information about the family reunion planning app click on the link found on this blog page or go to profiles.